Lock N More can replace a lost car key or make a duplicate car key 24 hours a day, 7 days a week. Get a car key replacement fast! Call 954-687-0885. Auto dealerships are in the business of selling cars, and they charge premium prices for other services. Lock N More’s business is installing and repairing locks and keys, so we can duplicate or replace your car keys for less! We are a locally-owned and operated, with our own staff of highly-trained locksmiths who have the right knowledge and equipment to quickly get you a car key replacement. We are fully licensed and insured. And, our technicians are carefully background-checked, so you can always feel confident and comfortable with the person who comes to help you. The fastest and easiest way to get a replacement car key is by calling Lock N More. 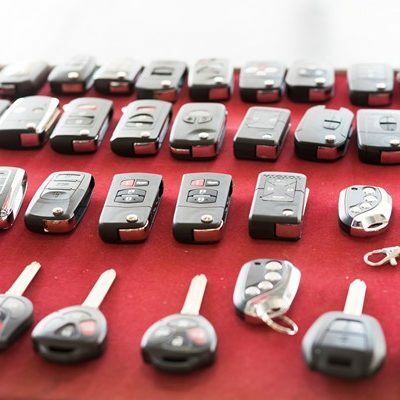 We have a large inventory of available keys for almost any make or model of car. Will it cost much to replace a lost car key? The cost of a car key replacement varies depending on the vehicle and the type of key. For example, a remote head key with a transponder chip will cost more to replace than a traditional flat key. Generally, the more functions the key fob performs, the more expensive the replacement. Also, keys for some luxury brands are just more expensive to purchase. Can you replace a smart key? Yes! Lock N More can replace any kind of car or truck key, including remote head keys, VATS keys, smart key fobs, and traditional keys. How can you cut a key to fit my car? We can usually get the information we need to make a new key for you from your VIN. Can I buy a replacement car key online? There are replacement keys available online, but we don’t recommend you buy them. There is no way to determine the quality of those keys, and they may not be OEM parts. In addition, some keys only allow one-time programming, so if you buy a key online and it has been programmed before, it may not be able to be programmed to your vehicle.